There’s certainly plenty of choice out there right now when it comes to finding the right gaming site for your slots and casino needs – and Captain Cooks Casino bonus codes may well offer you the lucky chance (or 100) that you are in search of when it comes to finding your way to a cool jackpot prize. Initially set up by Microgaming Casinos and overseen by Casino Rewards and Apollo Entertainment, this site has a rather different focus on online gaming than many of its contemporaries and rivals. 100 CHANCES TO WIN THE JACKPOTNew Customer Offer. T&Cs Apply. 18+. Please Gamble Responsibly. If you are interested in a fun and exciting site to sign up to why not try Captain Cooks? While there are stacks of slots and table games to enjoy here, there is an outward focus on offering new customers the opportunity to win big on one of their Mega Moolah games. For example, at the time of writing, there is over £5 million up for grabs – and when you sign up, you’ll get chances to grab that big prize for very little input. If you have tried other sites such as Wild Wins Casino online, we are sure you’ll enjoy this one as well. We will cover the opening deal for you below – but it’s also a good idea to consider just how well the site works on the whole – what are the terms and conditions like? Are there plenty of offers to get into on a regular basis? What are the standards of the games like – and is the site fully licensed for fairness and fun? 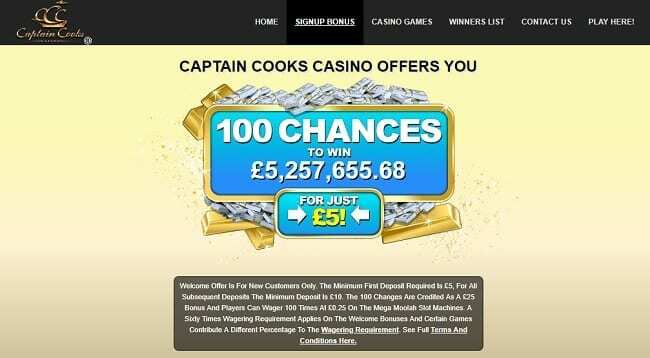 Take a look at our full Captain Cooks Casino review below to find out more about their popular opening deal and regular promotions to see whether or not the site appeals to your gaming needs! The current Captain Cooks Casino bonus for April 2019 is 100 chances to win a huge jackpot prize offered by any one of the Mega Moolah slot games supported at the casino. This means that you will be credited a certain amount of bonus cash to play with, weighted at a certain wager so that you can try your luck at the big prize. With a £10 deposit, you’ll be granted the equivalent of £25 in 25p bets for you to stake 100 times on Mega Moolah games, meaning that you can spread this free bonus credit across the various titles available and to try your luck at winning the big jackpot that’s available at any given time. You’ll need to deposit at least £5 to get started here. There are certain terms and conditions which come tied into this deal, which means that you will need to wager back a certain amount if you do wish to take money away. You’ll need to wager 60x the bonus received to be able to cash out at all, meaning that you are going to need to keep a close eye on your balance and your bonus pot if you are to make the most of this opening deal. Certain adjudication websites and reviews have pointed out that some customers of the site have found their bonuses restricted at times, as a result of additional requirements from the website or as a result of certain withdrawals being made. Therefore, it will be a wise move to consider other players’ opinions on how well this site performs, as well as our own – and as well as other adjudicating bodies who oversee various sites and gaming standards. The site does offer plenty of promotions, with a cash matching deal in place for your first few deposits set up should you wish to become a loyal player at the site. With a 60x wagering requirement still in play, you can claim cash matching on your first four deposits after you’ve taken advantage of that opening prize deal. On your second deposit, get 100% matching on anything up to £100. Get 50% matching on anything up to £150 on your third, 25% on anything up to £125 on your fourth, and 100% again on anything up to £100 the fifth time you deposit. We do like cash matching deals, though it’s worth bearing in mind that you will need to deposit £1005 in your own money to get full access to £500 in free bonus cash – and, all in all, you’ll need to wager back the money you receive by 60x before you can cash out. All bonuses considered that’s £30,000 you’ll have to pay back if you opt into everything. It’s a lot to bear in mind! There also appear to be concerns online as to the promotional emails that certain players receive from the site, some claim that deals are fairly constant, meaning that you may wish to set up a separate email address or keep a close eye on regular mail if you do sign up for promo details once you’ve registered. Compared to some sites of similar ilk, there are absolutely tons of games and casino experiences to pick from here, all very easy to pore through and dive into at your leisure. You can even play them via download or on the go, meaning that gaming has never been more flexible. There are loads of great games and bonuses available at Captain Cooks Casino. We enjoyed trying the various slots and using their latest promotions. Take your pick from up to 375 different slot games on the download (248 on-site), and a fair number of casino and jackpot games, too. There may not be the range of developers on board here which are in play at other sites, but there are at least the numbers here to help things stack up. Whether your game is video poker or if you just like the odd go on a big slot game, you have plenty to go at on the Captain Cook site. The jackpot games, including the site’s much-advertised Mega Moolah game chances, are well worth looking into. The website seems to exclusively make use of Microgaming casino games library and web design, which, generally, isn’t a bad thing. The brand is well-known and well-trusted across the web, meaning that, on the whole, you can expect to get plenty of fun as well as chances to win out of getting involved here. The features and Captain Cook Casino login respond very well across desktop, mobile and downloads, meaning that it really does take into account the best that the Microgaming engine has to offer. It’s a site which looks great and does perform well – but, as stated, it’s the terms you are going to need to look at. This is a very inclusive cross-section of methods which many other sites should aspire to! Do double check, however, that your chosen payment method is supported on the way out, too. There are several Funfair Casino Sites available online now if you’d prefer to use this method of cryptocurrency. However, there seems to be a minimum withdrawal amount in-play of £50 – this is far higher than what much of the competition requests – meaning that if your aim is to win big and to cash out regularly, you may not find this casino the best possible fit. There are wagering terms to take into account, too. There are Captain Cooks Casino download options here, which means that you can take an expanded version of the site and games catalogue with you to certain devices. Several other brands online offer mobile compatibility including the Rise Casino site and many more. This is great news for certain gamers – and what’s more, the website does generally perform very well across mobile devices, too. Simply log in and gain access to the site’s brilliant range of Microgaming titles on the go – via download or otherwise. Captain Cooks Casino bonus codes may do plenty to entice new players, but always keep an eye on those terms – and do take into account reviews and experiences from those who have played here before should you wish to get involved. Take into account how much you are paying in to get the free bonus credit on the opening deals – and otherwise, just enjoy the vast Microgaming library which is here – there’s good, and there’s bad, here – do always make sure to read up on terms and Captain Cooks Casino review pages before you start putting your own money regularly into the website.